Learning is becoming increasingly digital and more and more schools are adapting 1:1 iPad Program in their day-to-day activities. New ways of teaching and learning have put significant demands on the technology industry to provide teachers and students anywhere anytime broadband access, graphics processing ability, multi-media production tools and other innovations. 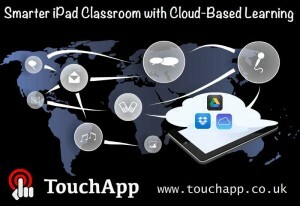 Access becomes increasingly important and “Cloud” offers solutions to create a paperless classroom with iPads. 1. The Cloud allows teachers and students to access all the data anywhere anytime. Assignments and projects can be processed from a variety of locations at users’ convenient time. 2. The Cloud supports diversified project collaboration. With the help of Google Drive, Adobe Creative Cloud etc, it is easy for teachers and students to collaboratively share, view and edit the same project individually. 3. The Cloud can also support to improve school management and administration. The education data of assignment marks, exam results, and services data etc. can be collected and stored in “Cloud” to guide data-driven decision making. 1. Mobile access to personal files and digital content can be achieved by mobile apps such as Dropbox and iCloud. Click here to see detailed instruction about how to transfer files from a computer to an iPad. 2. Google Drive is useful for teachers and students to share and collaborate through “Cloud”. In addition to 15GB free file storage space, Google Drive —formerly named Google Docs— is a productivity suite, which includes many built-in apps such as Slides, Docs, Forms, Calendar and Gmail. It is recommended for both teachers and students to set up Google Drive accounts and use it to distribute, submit and return assignments. 3. Using web to distribute teaching content. Many schools use learning management system such as BlackBoard, Moodle etc. to mange eLearning content and students can access subject contents through integrated mobile web browsers. Some iPad tools such as E-Lecture Producer help teachers to transfer static presentation (.ppt or .pdf) into HTML format presentation to publish online. YouTube is also a credible platform for teachers to deliver video content through web. 4. Build a community and keep learning from each other. There are plenty resource (such as www.teachthought.com) and discussion groups online for educators to share best practice. And you can start small with your students. There are always some tech savvy kids who can be helpful for you and other students. You are bound to improve together, and by learning together, you’ll form a sustainable community of Cloud learners. This entry was posted in Education, Technology and tagged Cloud-Based Learning, iPad for education, iPad for teachers, iPad in Classrooms, iPad in education, iPad tips for teachers, Mobile App development company, Mobile Learning on January 28, 2014 by touchapp.